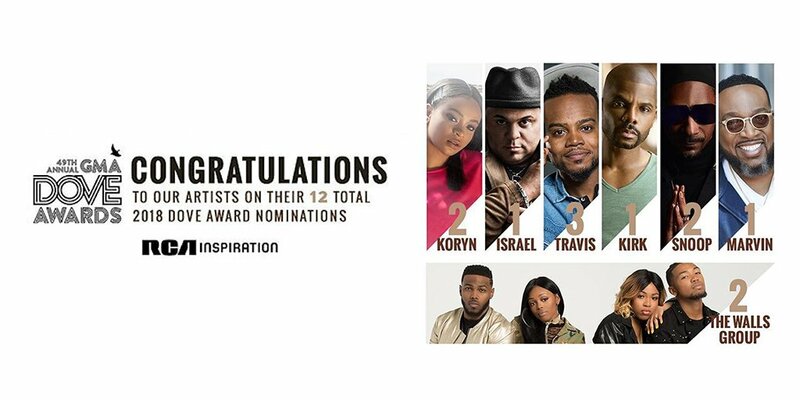 Nashville, TN (August 8, 2018) – RCA Inspiration artists received eleven nominations for the 49th Annual GMA Dove Awards. Releases from gospel and inspirational superstars Kirk Franklin, Travis Greene, Koryn Hawthorne, Marvin Sapp, and The Walls Group and hip-hop icon Snoop Dogg garnered nominations in eight categories: Gospel Artist of the Year, New Artist of the Year, Urban Worship Album of the Year, Contemporary Gospel/Urban Album of the Year, Urban Worship Recorded Song of the Year, Contemporary Gospel/Urban Recorded Song of the Year, Traditional Gospel Recorded Song of the Year, andRecorded Music Packaging of the Year. Additionally, RCAI artist Israel Houghton received a nomination for Spanish Language Album of the Year as a producer. Each year the GMA Dove Awards highlight the best in Christian and Gospel music, including Pop/Contemporary, Traditional Gospel, Contemporary Gospel, and other categories.